It's always amazing to see people take a game, turn it inside out and bend it to their whims. Mario is no different, particularly when it's beaten with the lowest score possible. 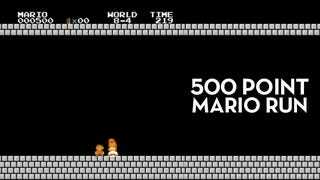 In a heart-stopping run—allegedly performed with no tool assistance—YouTube user NotEntirelySure clears Super Mario Bros. with the lowest score possible: 500 points. A similar, tool-assisted run was done by user HappyLee ages ago. Previously, NotEntirelySure completed a 600 point run. One hiccough: he does die once, but it's still amazing to watch. Check out the wall jump at 3:58 and you'll see what I mean.